See the world in glorious 360 degrees (or 2pi radians for mathematians). This mod renders the world 6 times, then collates it to show the full 360 degrees. Versions 2.1 and higher should be compatible with optifine. How would the Panini projection work in minecraft? Shaunlebron (creator of blinky) actually used the Panini projection when creating the simple view for Render 360. Between 90° and 180°, the output uses the Panini equation, transitioning from rectlinear to Panini. At 180° the output is the Panini projection. Between 180° and 320° the output is a mix of Panini and mercator. Above 320° the output is mercator. I should be able to add a Panini projection in the advanced settings menu. The Panini projection has been added. Have fun! Render 360 is missing mods it depends on. Include the following mods or remove Render 360. See 'latest.log' for technical information. So I've gotten it running (seems strange having required files as a separate mod?) but having the settings set to simple or advanced (anything other than off) still just leaves me with a black screen. and constant OpenGL errors spamming the chat log. Several people have reported this error, but I am unable to create it on my computer. If you force Minecraft to crash by holding "F3" and "C" for 10 seconds after changing to simple, it should create a crash report with all the information I need. Could you send that crash report to me in a private message? I'll start working on fixing the bug as soon as you send me the crash report. Wow!!!!!!!! how didn't I notice before that this was already made? The only problem is Minecraft performance using only one cpu core. Fps dropped a lot and even more when there's a lot of particles, as if the cpu had to render all the six screens and not just the gpu. Probably that shouldn't happen if a game was designed from scratch to work in 360, but I have no idea. Nonetheless, it great to see this fully working, in Minecraft!!! Can you update the 1.8.9 version? I'm trying to rewrite the mod to use geometry shaders. This should reduce the frame rate drop when rendering at high FOV. The only problem with this rewrite is that I know nothing about geometry shaders, and there is very little information about how to use them. This could take a while. I am planning to update the mod for all versions after and including 1.7.10 if possible. Unfortunately some of the methods I used to generate the 360 effect just don't exist in earlier versions. I don't know if the rewrite make any difference to this. You probably don't plan on it, but would you be willing to port to 1.7.10? I've been trying it for a little while now, and I'm actually starting to get used to it! 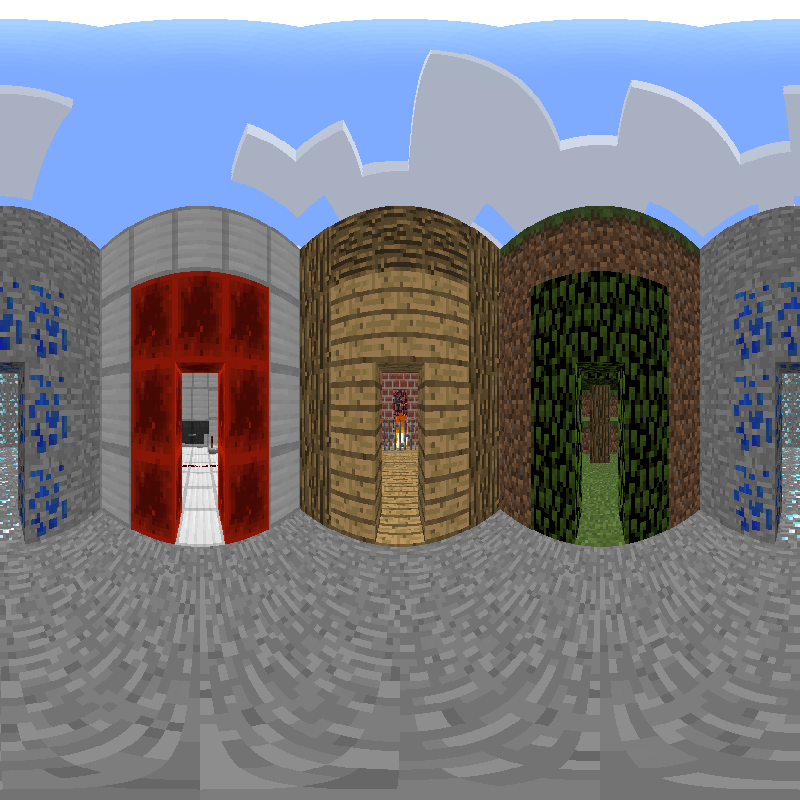 Equirectangular is my favourite so far, with Hammer being a close second. I could actually see myself playing it like that, once I finally get completely comfortable with the new perspective. Unfortunately, I'm still trying to reach a lot of goals in my 1.7.10 world, and it may take many months for me to do so, which is normally fine, but I think it could be much more interesting viewed in a way only this mod can manage. I have been working on a port to 1.7.10 for a few months. I have a few of the hooks in place, but I don't expect to have a working mod for at least a few weeks. I'll try to get something working for you asap. If you have any recommendations for the mod, I will do my best to implement them. It's great to hear that you're working on it! No need to rush because of me, I'm just glad it's happening. The biggest thing for me would be fixing the issue where everything is rendered fully bright; that could cause big issues in normal gameplay. Being unable to tell light levels in caves or your home, what phase the moon's on, etc. I trust that's in the pipeline, though? I have no idea what's causing the lighting bug. I'll look into it, but I don't even know where to start. I didn't think I'd modified any code that handled lighting. I don't mean zooming, I mean how, if you look at a distant object and turn your head so it's near the edge of your screen, you can see it in higher resolution than when looking at it straight-on. My guess is that's because Minecraft's rendering takes a flat plane, rather than a sphere or whatever it should be to eradicate this rendering artifact. So when you rotate your head, the sides of the plane are closer to the object. Unless that's what you were talking about, in which case sorry. I see what you mean. If you put the fov close to 180 degrees using the standard renderer, you can see the distortion at the edges more clearly. Also, the lighting bug has now been fixed. Have you been able to make more progress on the 1.7.10 port? The port has proved harder than expected. Most of the functions I rely on simply don't exist in the earlier versions of Minecraft. Even porting to 1.9 has resulted in many dropped features and I almost decided to stop working on it. I may continue to work on this in the future, but for now it's just not worth the effort. P.S. The source code is available on github. If anyone wants to work on a port, I am happy to assist. Is there any way you could make or integrate 3D stereoscopy (i.e. side by side or top bottom 3D)? If so, that would be AMAZING. I've had a look, and I don't think it's possible. Rasterisation (Minecraft's rendering engine), 360, and stereoscopic rendering don't seem to be compatible. I am working on a ray tracing mod that should be able to do this, but I don't expect to get it working within 6 months. Until then, I reccomend using the Replay Mod. You can record using the replay mod while using Render 360, but you will need to disable (remove) Render 360 to render a video with the Replay Mod.